At the prime age of adolescence when young boys and girls become aware of their looks, beauty and complexion, it is at this time that the perils of acne start. This is the time when a personality makeover starts and the children develop self confidence, self identification and evaluate themselves in context to the community, friends, mentors, parents and seniors. On the contrary appearance of acne causes a reverse effect and the youngsters avoid meeting people, social gatherings and places where they may be noticed which leads to guilt, anger, frustration, self conflict and a very negative outlook to everything in general. Acne is a disease that involves the oil glands of the skin. It is not dangerous, but can leave skin scars. Your skin has pores (tiny holes) which connect to oil glands located under the skin. The glands are connected to the pores via follicles – small canals. Sebum, an oily liquid, is produced by these glands. The sebum carries dead skin cells through the follicles to the surface of your skin. A small hair grows through the follicle out of the skin. Pimples grow when these follicles get blocked and infected. They tend to appear on the patient’s face, back, chest, shoulders and neck. 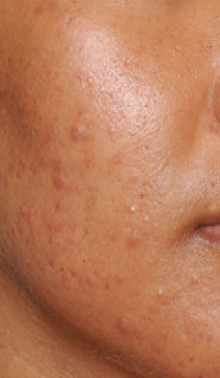 Acne Simplex – eruptions are minor and small in size appearing mostly on face and maybe with mild bacterial infection. 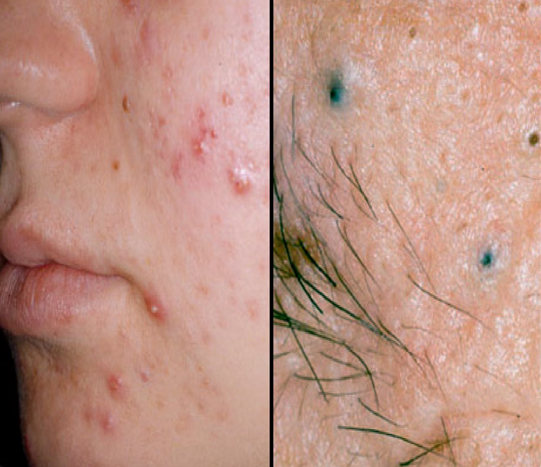 Acne Vulgaris – eruptions mostly occur in areas with dense sebaceous follicles. They appear as inflammatory papules, pustules and nodules. Acne Rosacea – These are the most severe form where confluent red papules and pustules are seen with higher degree of redness all over the area of erruptions. 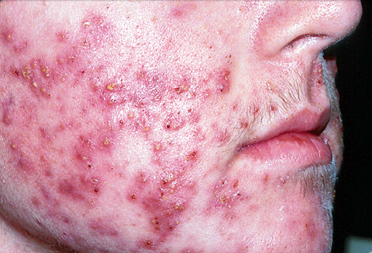 Starting from the young age of 11years to 13 years acne occurs any time even in adults till the age of 30-35 years. The oil producing sebaceous glands which are responsible for the luster and glow of an individual’s skin start over reacting to the hormones giving rise to greasy skin blocked and infected pores and blackheads resulting into various types of Acne. Girls and women with acne tend to get it worse one or two weeks before their menstrual period arrives. This is probably due to hormonal changes that take place. Conditions like Polycystic Ovarian Disease or Syndrome (PCOD) also pre dispose acne. Anxiety and mental stress, lack of sleep, night watching, anger and indignation leading to depression cause thyroid dysfunction and altered androgen hormones making acne worse. The patient has a lusterless complexion, dark circles around the eyes, dull and dry un-managable hair with a reluctance to look at their own image in the mirror. Stress also makes some people do binge-eating and acne worsens from oily foods and chocolates. Hot and humid climates which lead to more sweating can cause a rise in the eruptions especially if cleanliness level is not maintained. Using Oil based products like moisturizing creams, lubricating lotions, and all makeup that contain oil will speed up the blocking of your pores leading to aggravation of acne. The trick is to be aware of the quantity and type of product to be used according to the four seasons we have. Certain hair products are very greasy and might have the same effect as oil based makeup. Dandruff is also a major factor leading to blocked pores and formation of acne and also leads to secondary fungal infection. 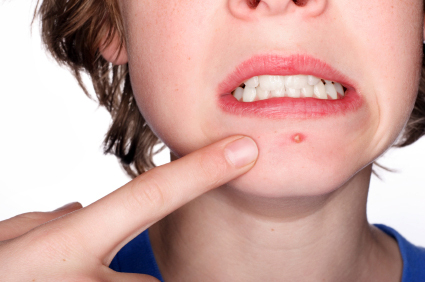 Squeezing the pimples can cause the acne to get worse and can cause scarring which is major effect in obstinate cases. mouth ulcers, unhealthy teeth and dull complexion. The Undebatable and time tested treatment of Homeopathy aims at treating the causative and precipitative factors and the homeopathic remedies can be taken for years together without any side effects. Disturbed intestinal flora, constipation and accumulation of nitrogenous wastes leading to outbreaks on skin are tackled with medicines like Granatum, Acid tannic, Natrum Phos and Allium sativa. Altered hormonal level is mainly taken care without the support of external hormones with effective medicines like Pulsatilla, Cimicifuga, Oophorinum. Bad effects of night watching and stresses are covered by detoxicating and rejuvenating well tolerated medicine Nux vomica, Acid Nitric, Cocculus Indica. They also help in managing the effects of accumulated sleep patterns. Bovista, an important homeopathic remedy is a boon for persons with sensitive skin which helps them to combat acne due to excessive use of cosmetics. Co-existing dandruff and excessive perspiration which are a part of acne prone skin is perfectly tackled with Sanicula, Thuja, Badiaga and Merc Sol perfectly aim at targeting these concomitant complaints. The above prescriptions are well supported with the Constitutional, deep acting medicines is prescribed after a comprehensive case taking and the hereditary tendencies are tackled by anti-psoric and anti-tubercular miasmatic medicines. For a combination skin Selenium and Berberis Aquifolium is more suited. For oily skin Merc sol is prescribed. For dry skin Psorinum and Teucrium are the indicated medicines. Small pustular eruptions are tackled by medicine Sulphur iod and Berberis Aqui. Large painful ones with indurations are prescribed Radium Brom and Osmium met. Typical obstinate nest acne located on back and chest indicate Rumex, Carbo veg and Ginseng. Erruptions on chin are covered by Ichthyolum. Acne on nose is the forte of Carbo animalis. Wash your face at least twice each day. Use a mild soap made especially for people with acne, and warm water. Do not scrub the skin. blocking and worse swelling and redness. Popping pimples makes scarring more likely. Try to refrain from touching your face with your hands. when applying lotions, creams or makeup. Spectacles should be cleaned regularly since they may collect sebum and skin residue. make sure they are cleaned regularly. Don’t go to sleep with makeup on and cleanse face thoroughly to clean of all oil and dirt which cause acne. Too much sun can cause your skin to produce more sebum.